It's not easy being a football referee, and it's not easy running a cafe in an age of online reviews. Especially in Italy, famous for its passion for the beautiful game and its love of good cuisine. So when referee Piero Giacomelli made two controversial decisions during Lazio's 3-1 home defeat to Torino in Serie A on 11 December, Lazio fans decided to retaliate - against his restaurant. 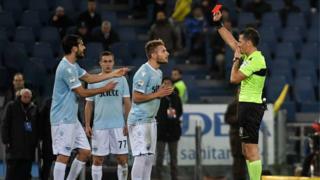 Fans were outraged by Giacomelli not penalising Torino's Iago Falque for handball and for issuing a red card to Ciro Immobile for headbutting Nicolas Burdisso. On hearing Giacomelli ran a food-serving cafe in Trieste in northern Italy, angry Lazio fans took to the review site Trip Advisor and Google reviews to vent their frustration. Since Lazio's defeat there have been a flurry of bad reviews for Cafe Rossetti, believed to be run by Giacomelli. Many posts appear to be directed at the referee personally, rather then genuine complaints by dissatisfied diners. One Google review read: "Do you cook like you referee?" Another reviewer posted: "This place is as bad as Giacomelli." Others used the opportunity to mock the food and service even though there is no evidence to suggest those posting one-star reviews in the past few days had eaten there. According to Italian news publications, including Rome-based newspaper Il Messaggero, there were also some negative reviews published on travel website TripAdvisor. The restaurant is rated on the site as 'excellent' by 56% of reviews, at time of writing, and all 'poor' or 'terrible' reviews currently available on the site were posted prior to the match. But Lazio fan website La Lazio Siamo Noi has screenshots of what it claims are reviews posted on TripAdvisor since the match and before their removal from the site, which are also being shared on Facebook. It is not clear whether Giacomelli is still the owner of the cafe, and website Football Italia says he is no longer running the business. The Facebook page for Cafe Rossetti also appears to have been taken down. The BBC have tried to contact Cafe Rossetti for comment.